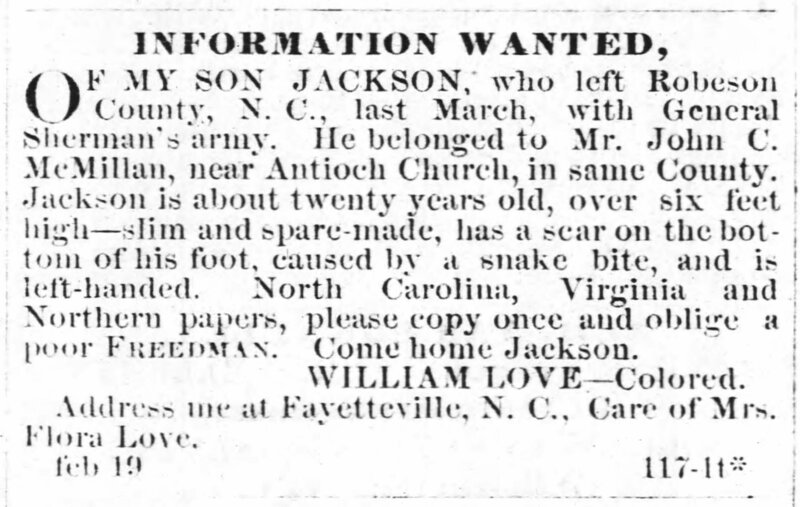 William Love is looking for his lost son, Jackson. He left with General Sherman's army in March 1865, during the Civil War. Sherman's army. 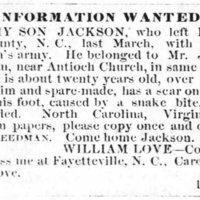 He belonged to Mr. John C.
McMillan, near Antioch Church, in same County. poor FREEDMAN. Come home Jackson. Address me at Fayetteville, N.C., Care of Mrs. Flora Love. 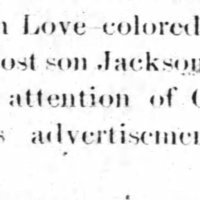 jodibash, “William Love looking for his son (2 ads),” Information Wanted Ad, Wilmington Daily Dispatch (Wilmington, NC), February 19, 1866, Last Seen: Finding Family After Slavery, accessed April 19, 2019, http://informationwanted.org/items/show/1122.